Since former museum intern, Nick Rudell, is now working at Circuit City in Grand Rapids and former intern, Candace Prill, was not sure of the timing of her return from Ecuador, where she has been teaching this winter, there will be a new face behind the counter this summer. Fellow artist, Kim Amthor, will be behind the counter much of July and August. This is necessary in that I’ll be busy with 3 summer shows as well as my son’s wedding. As I explained on the home page, while agate picking the first night, we engaged in conversation with a fellow picker who said he was a part-time employee of the gravel pit. He told us about the vandals who had stolen wire off the heavy equipment, causing $5,000 in damage and shutting down the gravel pit this spring while repairs are being made. He also explained that after years of resisting the trend of closing gravel pits, the owner is now going to close our favorite pit. This is the same owner that kept the pit open to agate hunting even after his three-generation collection was stolen a few years ago. We were so upset that thieves had ruined it for those of us who enjoy agate picking at the Omar gravel pits, that we decided to meet with the owner to tell him how sorry we are that people don’t respect his generosity. 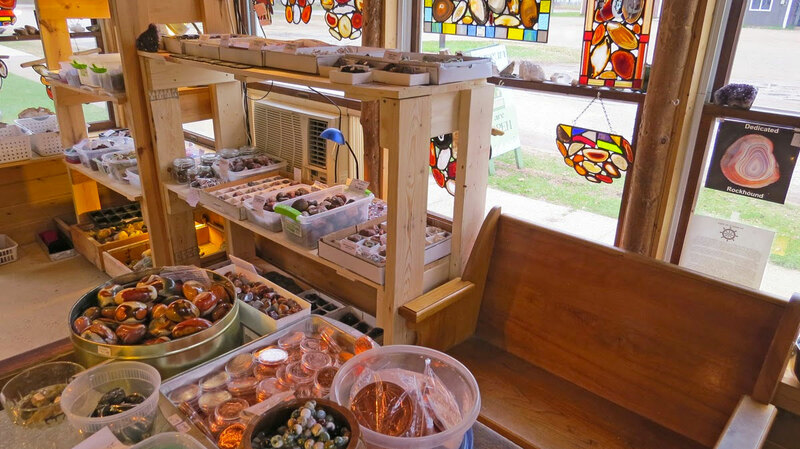 I also decided to gift the owner, Doug Omar, with a free agate window as thanks for many hours of happy hunting in his gravel pits. After listening to Mr. Omar’s stories, we were even more outraged at the behavior of “visitors” to his gravel pits. Not only was wiring taken off the equipment this spring, but also last fall. In addition, more and more people have been littering at the pits including burying dirty diapers in the gravel. Apparently, when he sells a load of gravel that contains littered garbage, he doesn’t get paid for the gravel. Parents also let their unsupervised kids climb and disrupt the sand piles, and throw rocks around the pits. This rock throwing is dangerous and could harm other agate hunters. Also, the kids mix the rocks from one sorted pile to others. Some agate pickers are also TOO bold. They climb dangerous vertical cliffs risking injury or death should the sand and gravel collapse. They also refuse to stay away from working equipment, often disrupting operations and risking injury. Finally, during nonworking hours, four wheelers tear up the pits. Two who were four wheeling while intoxicated were seriously injured. One had to be airlifted to the hospital. These are just a few stores — there are many more. Doug, should you read this web page update, I would like to thank you for allowing us access to your pits. I don’t blame you for closing them. On behalf of all those who have spent happy hours looking for agates in your gravel pits, thanks for all the years of happy hunting.